Legal Wrangling Alert: The Wawona is temporarily known as "The Big Trees Lodge" due to a trademark dispute with the park's former concessionaire, Delaware North. 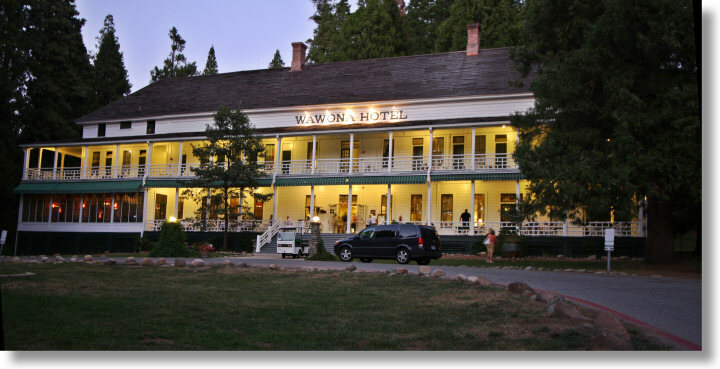 The Wawona Hotel, a National Historic Landmark built in the 1870's, is the hub of the southern Yosemite area. It's across the road from Yosemite's only golf course and around the corner from a gas station, a gift/grocery shop, a post office, and a mishmash of historical buildings. Hubness is a relative quality, however. The Wawona opens onto a meadow, and with its verandas, large lawn, and rooms without phones or televisions, has the most laid-back vibe of Yosemite's hotels. Lodging: The Wawona contains 104 hotel rooms in six different buildings. 50 of the rooms have private bathrooms, and 54 share community bathrooms. Nearly all the rooms open onto one of the Wawona's famous verandas. Room prices start around $150 and vary depending on several factors - time of year, whether or not the room you want has a bath, whether or not it comes with breakfast or lunch, and whether or not they've changed the prices since I wrote this. Dining/Shopping: The hotel has its own dining room, plus a lounge where Tom Bopp, a fixture since 1983, plays piano and sings. You can buy assorted snacks and souvenirs at the Pioneer Gift & Grocery Shop, just around the corner from the hotel. The Thomas Hill Studio, on the hotel grounds, sells Yosemite-related books and maps. The Wawona is seven miles (11 km) from Fish Camp, where you'll find a pair of restaurants in the Tenaya Hotel and a third at the Narrow Gauge Inn. Nearby Hiking: The Wawona Meadow loop starts directly across the road from the hotel's driveway. The Chilnualna Falls trailhead is just a few miles away. The Mariposa Grove of Giant Sequoias is seven miles (11 km) distant, and you can take a free shuttle bus to the grove from the parking lot of the grocery shop around the corner. In case you scoff at the idea of climbing onto a bus to ride sub-marathon distances, a trail to the grove starts just behind the hotel. There's been a mountain lion spotted on this trail in recent years, so I don't recommend hiking it alone. Other Stuff To Do: The Wawona has ready access to golf, tennis, and a swimming pool - the sort of amenities you'd be more likely to expect in Hawaii than a national park. The golf course, in particular, seems incongruous here, but it doesn't appear to be going away any time soon, so you might as well enjoy it. The nearby Wawona Stables offer guided horseback tours to Chilnualna Falls and around the Wawona Meadow loop trail. Bicycles are also allowed on the loop trail, a rarity in Yosemite. The meadow trail is, to boot, one of my favorite places to run in the park and a great hike for wildflower fans, usually peaking in May or early June. The Pioneer History Center is a short walk from the hotel. It's home to historical buildings collected from around the park. Highlights include a covered bridge and a set of antique (like there's any other kind) stagecoaches. The road that crosses the golf course directly across from the Wawona's main drive, incidentally, is the old stagecoach route into Yosemite, and still connects to points in Fish Camp and near Mariposa. Just around the corner from the Wawona Hotel is one of Yosemite's rare pockets of private property. The roads to the Chilnualna Falls and Wawona Swinging Bridge trailheads are lined with homes, many available as vacation rentals. The Redwoods in Yosemite is the dominant player here, managing more than a hundred of them. Roughly a mile north of the hotel is the Wawona Campground, one of the few Yosemite campgrounds that stays open year round. It has a pleasant location along the Merced River, and several of the campsites are on the riverfront. You'll need reservations for a summer stay - it gets booked up months in advance - but winter is walk-up only and there's usually no problem getting a site. Six miles from the Wawona (and a mile outside the park's southern entrance), in another enviable location, is the forest service's Summerdale Campground. It's not as well known as the Wawona Campground, but it's still popular - it gets booked up for weekends two or three months ahead instead of six months ahead - so reserve as soon as you know your dates if you want to stay here. The Summerdale is closed in the winter. Another mile past the Summerdale is Fish Camp, which has a variety of lodging options. Twelve winding miles north from Wawona (i.e., towards the Glacier Point turnoff and Yosemite Valley) is Yosemite West, a collection of private holdings right on the Yosemite boundary, and only accessible from the park. Home and condominium rentals are the primary options here. © 2006+ Russ Cary. All Rights Reserved.